Cotman, from the makers of Winsor & Newton Professional Watercolors, offers a selection of good-quality watercolors. 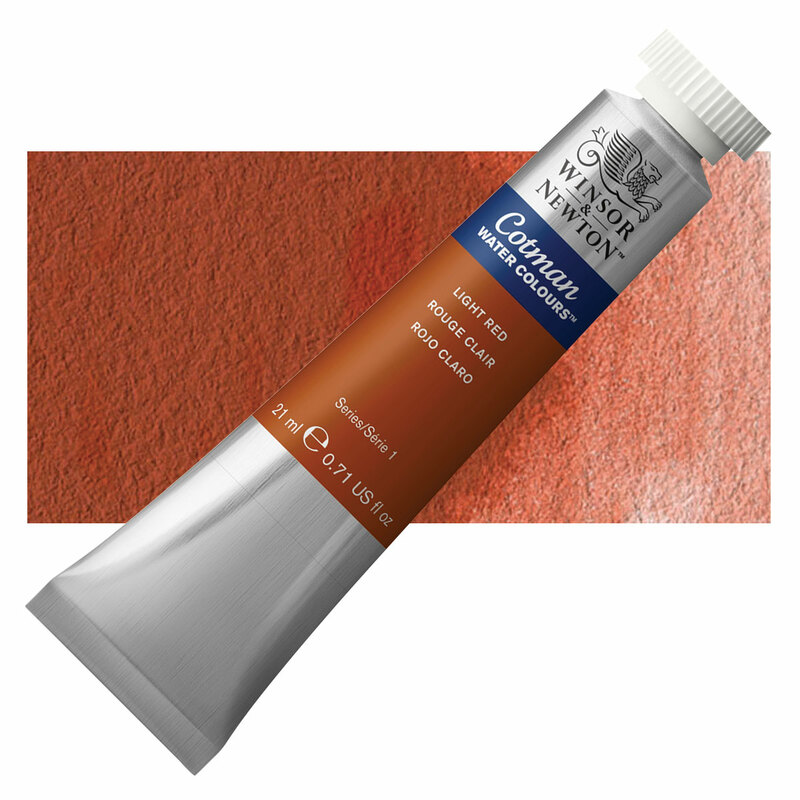 The Cotman line includes both traditional pigments and reliable synthetic colors that replace some of the more rare and expensive pigments used in the Professional Watercolors. Color Swatches created using heavy application/diluted application and were applied on cold press watercolor paper (150 lb) material. Red iron oxide varies in hue and transparency, depending on hydration and slight impurities. Indian Red is a slightly duller, deep brick hue with a bluish undertone. It is very dense and opaque, with excellent tinting strength and covering power. It is dependable when mixing with all other permanent pigments and yields good flesh tints when mixed with Zinc White. It is the synthetic version of PR102, which is a pigment made from earth reds, or natural red iron oxides, and the names applied to PR101 and PR102 often overlap. The synthetic red iron oxides have mostly replaced natural red iron oxides and are brighter, stronger, finer, and more permanent. Indian Red is the highest grade bluish shade. Light Red, English Red, and Venetian Red are yellowish shades. Mars Violet is a dull and subdued bluish or purplish oxide. Red iron oxide is very lightfast with excellent permanence. Red iron oxide has no significant hazards. Natural red iron oxide comes from the mineral ore hematite, called bloodstone by the ancient Greeks from the word hema , meaning blood . It is one of the oldest pigments, has been used by every major civilization, and was an important mineral for medieval alchemists. It was not widely used in artists' materials until the 17th century and was not produced in large quantities until the 18th century. Indian Red, Colcothar, English Red, Light Red, Mars Red, Mars Violet, Morelle Salt, Pompeian Red, Indian Red, Red Oxide, Sinopia, Spanish Red, Terra Rosa, Tuscan Red, Venetian Red, Venice Red. ™ Winsor & Newton is a trademark.™ Cotman is a trademark.